"Bearded dragon" is most commonly used to describe the central bearded dragon, (Pogona vitticeps). Members of this genus live in the arid, rocky, semidesert regions and dry open woodlands of Australia. They are adept climbers, spending time on branches and in bushes and near human habitation. Pogona species bask on rocks and exposed branches in the mornings and afternoons. They are found throughout Australia. The genus is in the subfamily Agaminae of the family Agamidae. Part of the Lizard family, their characteristics include broad, triangular heads and flattened bodies with spiny scales arranged in rows and clusters. These are found on the throat, which can be expanded when threatened, and at the back of the head. These spiny scales are used to scare off predators, yet they are not very sharp. Bearded dragons display a hand-waving gesture to show submission, and a head-bobbing display to show dominance between dragons. They have the ability to change color during rivalry challenges between males, in response to ambient temperature changes such as turning black to absorb heat, and other stimuli. Males grow up to 40 to 60 cm (16 to 24 in) long, and females up to 30 to 51 cm (12 to 20 in). 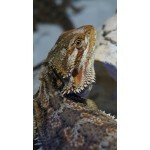 Pogona is a genus of reptiles containing eight species, which are often known by the common name bea..